The history of Perryopolis wouldn’t be complete without a reference to coal mining. Although Perryopolis itself is not a “company town” — a town built and owned by a coal company to house miners and their families close to the mines -- there were coal mines in and around town, and Perryopolis is surrounded by coal mining towns and patches. Star Junction, Victoria, Sweetcake, Panicktown, Whitsett, and Wickhaven were all coal mining towns or patches. The coal companies owned the stores in which miners shopped, and these stores sold just about everything the miners needed, from food to clothing to coal itself to heat the miner’s houses. The miners also liked to shop elsewhere when they could*, and Perryopolis businesses benefited considerably from the local coal industry from the middle of the 19th century until the 1950’s. Many Perryopolis residents are retired miners, and many more are the sons and daughters of coal miners. All of the photographs on this page were made at Southwestern Pennsylvania mines. Although it is not known at which mines most of the photographs were made, the first photo shows Colonial 3 mine at Rowes Run, near Gridstone, in 1937. The enormous slate dump from this mine still stands alongside the Grindstone-Brownsville road. 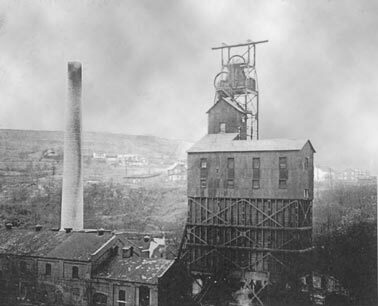 Your webmaster’s father, Louis Earl Illig, and many other Perry-area men worked in this mine. Colonial 3 closed in the late 1950’s. The other photographs are undated, but they are from an earlier time, most likely the very early 1900’s. 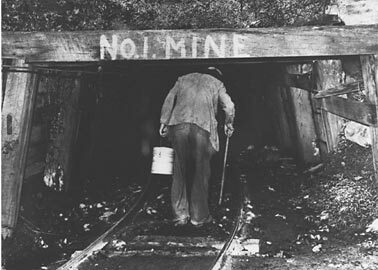 The dramatically successful rescue of nine miners who were trapped underground by a flood in Somerset County in July, 2002, serves as a reminder that coal mining is still very much a part of life in Southwestern Pennsylvania, and that the men who go into the mines to bring out the coal are still brave men, though they would never say so. * There was a time when the virtual enslavement of miners by the coal companies was so complete that the miners’ meager pay came in the form of scrip that had no value except in the company store. 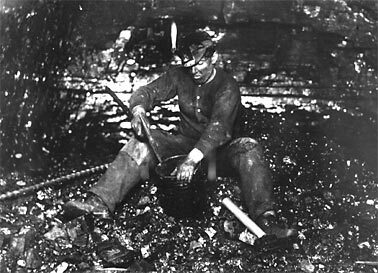 How much were coal miners paid in the 1890’s? Find out here. 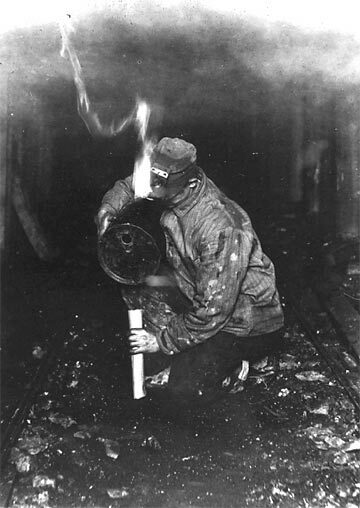 Above: Shot Firers, the men who drilled holes in the coal face and inserted tubes filled with black powder, then set off explosions to loosen the coal. This was one of the most dangerous jobs in the mine. The mere proximity of the miner’s oil lamp to the black powder was sufficient to ensure that. Then there was the danger of a premature detonation. It was a premature detonation that killed Adam Baughman, your webmaster’s great grandfather. Note the drill bit to the miner’s right in the top-right photo. These men had a problem. A coal car, used to carry coal out of the mine, has overturned. They had to shovel the same coal twice, but they only got paid for shoveling it once. 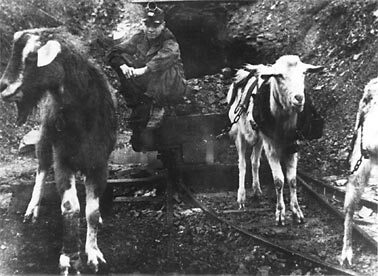 Goats pull a load of coal out of the mine. The coal companies also used mules and women and children for this job. It was said among the miners that the company didn’t care if a man (or woman or child) got killed, because they were easy to replace. If a mule got killed, however, there would be hell to pay because mules were expensive. 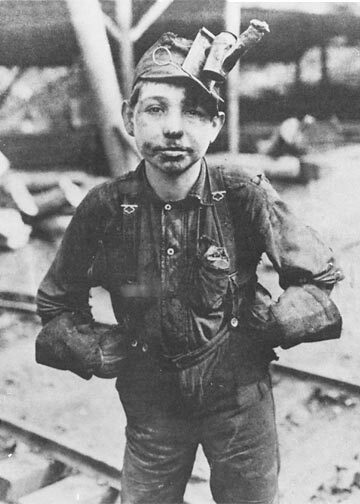 A child coal miner. The bag in his left pocket contains chewing tobacco. This roof-fall photo may have been staged as a safety warning. Then, too, it may be real. A roof-fall was not the greatest danger that miners faced (and still face). That was, and still is, the danger of the explosion of methane gas. Methane is a natural by-product of the organic processes that took place millions of years ago when coal was formed. In earlier times, safety officials would go in to check the mines before workers entered. Coal dust is also a dangerous explosive. Today, electronic sensors constantly monitor for methane and for Black Damp, a mixture of nitrogen and carbon dioxide that can cause suffocation if sufficiently concentrated. Another invisible hazard is lung disease (pneumoconiosis or “Black Lung”) brought about by breathing coal dust. This sign is at the Olive Branch Cemetery, located on Rt. 981 between Rt. 51 and Smithton. It reads “On Dec. 19, 1907, an explosion killed 239 men and boys, many Hungarian immigrants, in Darr coal mine near Van Meter. Some were from the closed Naomi mine, which exploded on Dec. 1, killing 34. 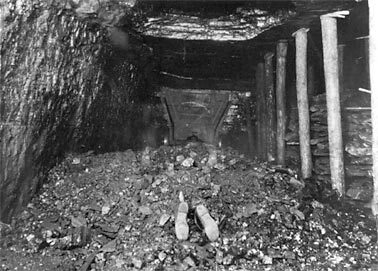 Over 3000 miners died in Dec. 1907, the worst month in U.S. coal mining history. 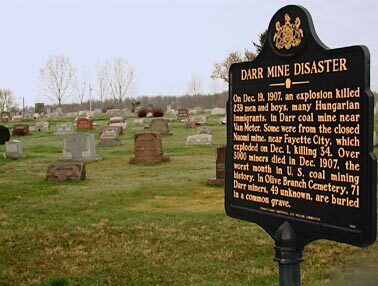 In Olive Branch Cemetery, 71 Darr miners, 49 unknown, are buried in a common grave.” Sign placed by the Pennsylvania Historical and Museum Commission. You can read contemporary accounts of the disaster at http://usminedisasters.com/saxsewell/darr.htm. 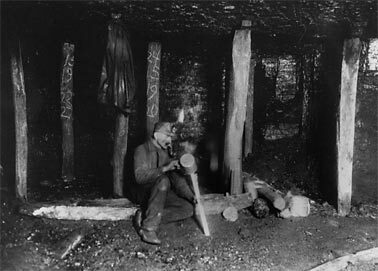 In every year from 1900 to 1945 more than 1,000 coal miners were killed in mining accidents. 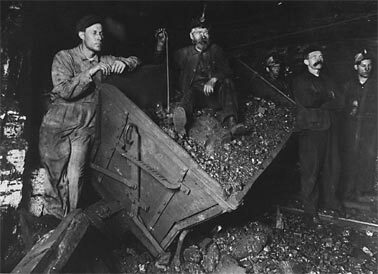 In many years there were more than 2,000 deaths, and, as noted above, in just the month of December, 1907, there were more than 3,000 coal-mining deaths. In 1961 there were 293 deaths; in 1981 there were 153, and in 2001 there were 42. It sounds like coal mining has gotten a lot safer, and no doubt it has. But there are also far fewer coal miners in the United States than there were in the first half of the 20th century, and much mining today is done by the less dangerous open-pit method. The effect of these factors on the number of mine deaths is unknown. Suffice it to say that underground coal mining remains one of the most dangerous occupations in America, and it is even more dangerous in less developed countries where safety regulations and enforcement are more lax. Hundreds of miners die in explosions in China each year. The death toll has also been high in Poland and the Ukraine.